Context and variation: Summer of the Pill: Why do we menstruate? Human behavior, evolutionary medicine... and ladybusiness. Summer of the Pill: Why do we menstruate? This is part of my Summer of the Pill series, where I will answer a question about the birth control pill every week for the summer. I will try and make them shorter than my usual posts. Please remember that I am not a medical doctor, so do not use this material to diagnose or treat any condition. I still hope you find these posts informative and useful. One of the questions I got on my inaugural Summer of the Pill post is one that I have been asked many times over the years: Why do we menstruate, and is it even necessary while on the pill? So first, let me back up and explain the modern birth control pill. Most of the standard, monthly pill packs have three weeks of synthetic hormones that you take daily. These hormones out-compete your natural ones, which is how they suppress ovulation. Over the course of these three weeks your endometrial lining is also building up some in response to these hormones. For many adult women in urban, or industrialized environments, the amount of synthetic hormone is lower than what their body would naturally produce, so the lining of the uterus is less thick than it would usually be. The fourth week is a placebo week – you don’t have to take these pills, but you are usually encouraged to just so that you keep up the habit of taking a pill every day – and the absence of the synthetic hormones in your body triggers menstruation. Then you slough off the endometrial lining that was thickening and again, if you are one of the many adult industrialized women for whom the pill is designed, then you should actually have a lighter period than what you have in a natural cycle. 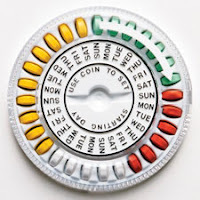 The placebo week in your standard pill pack is there because the original maker of the pill thought women would be disturbed by the absence of a period. And there are still many women who would prefer to get their period than not. But what about the women who would just as gladly stop menstruating at the end of each cycle or pill pack? Would this be a safe decision? In order to get at these questions, I will answer three different ones for you: Why do we menstruate? What did we do back in the day? and What is appropriate today? Adapted from Fleagle 1999 by me. Humans are not the only animals to undergo cycles of growth and regression in our endometrial lining. Yet, only a few animals actually menstruate. 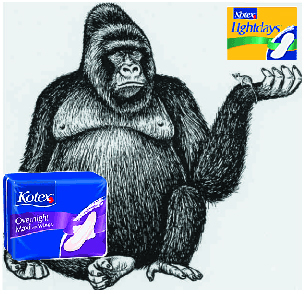 Menstruation has occasionally been observed in other great apes (this is the primate group where humans belong, with the chimps, bonobos, gorillas and orangs), and a few other animals. As far as we can tell, everyone else resorbs the lining before growing a new one. It seems to be that those animals who menstruate, do so because the amount of lining they have is greater than what they are able to resorb. Then, even among those few other animals who have been occasionally observed to menstruate, only humans are copious menstruators. That is, we’re the only ones who seem to do it every time a cycle ends, in a large enough quantity that it is visible (and those of us in industrialized environments know it’s more than just visible – there is a whole section of the drugstore devoted entirely to pads, tampons and cups to help us dispose of it). Most people seem to think that the reason humans have such thick endometria, that produce the byproduct of copious menstruation, is that we have big-brained babies with high oxygen and glucose needs. We have the most invasive trophoblast of all animals, where the selfish little bugger burrows its way right through the endometrium in order to set up shop and start making the placenta. And so the thickness and differentiation of the endometrium, as well as the precise timing of its readiness for implantation and network of blood vessels at the ready to feed that fetus, make it a highly specialized tissue of a rather significant quantity! What did we do back in the day? These days the average industrialized woman menstruates about 400 times in her life, and like I said, that menses is copious. Average menstrual blood loss is around 30mL, but anything below about 120mL is considered normal. However, women in more traditional environments, particularly those who are foragers or pastoralists, menstruate far less frequently, only around 50 times (Strassmann 1997). Part of the reason for this is that their first period is much later in life, say around seventeen years old rather than twelve or thirteen, and that they expend a lot more energy and eat fewer calories each day (Strassmann 1997). But there is another reason that the traditional environment, the one we assume humans evolved in, leads to far frequent menstruation: these women usually don’t have access to contraception, and thus practice what is called natural fertility. So the average number of live births for these women can be as many as eight, and even with high infant mortality that’s a lot of babies. Add to that the fact that these women will breastfeed through toddlerhood, and you have several menstruation-free years. Figure 1. The industrial (top) versus nonindustrial (bottom) pattern of menstruation through the reproductive life span. The pink bars represent infrequent menses, the red bars represent frequent menses; breaks indicate no menses due to pregnancy and lactation. Note that the first period begins earlier in the industrialized pattern, and that fewer births, less breastfeeding, and more calories lead to more frequent menses across the reproductive years. So the industrial pattern doesn’t look anything like the nonindustrial, or traditional pattern. But the pill doesn’t necessarily look like either pattern – in terms of the number of menstruations it is like the industrial pattern, but in terms of ovulations it’s likely closer to the traditional pattern. The question is whether one of these patterns is necessarily healthier. I will partially answer this today. The placebo week of the pill is not necessary for contraceptive purposes, and the menstruation that occurs during this time may not be important for most women either. The two things worth talking to your doctor about are breakthrough bleeding, and the additional week of hormone exposure per month. Breakthrough bleeding is when you have some kind of blood discharge at a time other than when you would expect to menstruate: when on the pill this would be any other time than the placebo week. And this can be very common in some populations even when using the normal pill preparations with the placebo week (Bentley 1996, Vitzthum et al 2001, Vitzthum and Ringheim 2005). Young users of the pill (say under 25 years old), athletes, and users from nonindustrial populations may be especially at risk. If you have breast cancer or other reproductive cancers in your family history that are of the hormone-responsive variety, you may not want to expose yourself to any more hormone than you have to. The amount of hormone exposure in one’s life is correlated with risk of breast cancer (Jasienska and Thune 2001). However, the question of whether taking the pill helps or hurts your breast cancer risk is a very murky issue, and one that I will try to address in its own post later this summer. Something you’ll read in this Summer of the Pill series is that making decisions about reproduction is about understanding trade-offs. You need to weigh the reasons you take the pill with the side-effects or negative impact of the pill, if you experience any. And many women out there could make up a pro/con list for taking the pill, or changing preparations, or skipping the placebo week, or changing to an IUD, and find that they weight each item very differently. There is rarely a single right answer. Bentley, GR. (1996) "Evidence for interpopulation variation in normal ovarian function and consequences for hormonal contraception" in Variability in human fertility, eds L. a. M.-T. Rosetta, C.G.N. (Cambridge University Press, Cambridge, UK), pp 46-65. I would like to add that I take my pills straight through to combat another hormonal related problem - I have severe migraines linked to my cycle and they are reduced by being on a steady dose of hormones. If there are other women out there suffering from migraines, it's a good idea to chart your migraines along with your cycle on a calendar so you can see if they are also affected in this way. If so, this may be a therapy option to discuss with your doctor. Thank you for this. I took pill packs back-to-back for over 6 years and it worked wonderfully. And yes, to reference Erica's comment above, my migraines were significantly reduced. BUT...then I had my daughter and it's like my hormones are completely different at baseline. I get breakthrough bleeding now and I'm having mood issues I didn't have before. So now I'm looking at a non-hormonal IUD. Before taking the Pill, I was also on Depo for 5 years, which means I essentially didn't menstruate for over ten years. I don't have a genetic link to breast cancer so it seemed like a reasonable gamble. I guess we'll see if there are any long-term consequences, but if anyone's interested in trying it, I can recommend it. Can we assume all of this information relating to "the pill" is also relevant for other hormonal contraceptive methods such as the ring? Also- regarding the comment about increased hormone exposure as a possible trigger for breast cancer- can't this also be an issue for women who do not get pregnant at all in their lifetime (or with as much frequency as more traditional societies)through use of non-hormonal barrier methods? I'm thinking they are exposed to a more steady stream of cancer-causing hormones than women who are often pregnant/lactating..
Additionally, I understand fat breaks down into estrogen. With many industrial women being quite heavy, can this also be contributing to increased breast cancer risk? How can we disentangle obesity and cancer formation from contraceptive use and cancer formation? Erica and Karen, thanks for commenting. Yes, continuous hormones can do wonders for women who suffer from migraines (though strangely, there are some women who seem to get headaches from the pill). And Karen, my cycle is very different now that I have had a child! And while I didn't used to have changes in mood, I do now. Very interesting stuff. Anon, I'm not 100% certain that the experience of the pill and the patch or ring are the same -- they are sometimes the same hormone, sometimes not. And some studies I've read lump all hormonal contraceptives in their studies, while some focus only on oral contraceptives. I'm sorry that I don't have a better answer. As for your question about hormone exposure -- yes, back when doctors were first figuring out breast cancer they called it the nuns' cancer because nuns got it in far greater quantity. Nowadays not having kids is only one thing to worry about, since, as you said we are so much heavier than we have ever been. That is probably an even greater problem now. As for your last question, the way you can disentangle this is to only study average weight subjects, or you can statistically control for weight. But I agree that these are interrelated issues. This is a great post (and series). I second the comment about the migraines, although I decided the risk of extra hormones wasn't worth the relief (for me) because I am still functioning with migraines. Interestingly, I take a pill designed to combat hormonal acne (called Diane in Australia - not sure what it is in the US), but I still break out in my week off the pill. 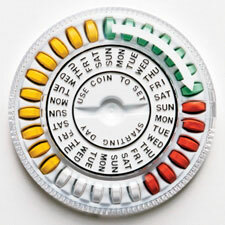 To see if I could combat this, I tried taking the pill continually; however, I wasn't able to cheat the system. Instead of breaking out every 4 weeks, I was just breaking out every 6 or 8! Not sure what the scientific basis for this might be (if any), but just an interesting tidbit. Excellent post on hormonal contraception, I especially enjoy the perspective of other cultures and species-- something we don't really cover in med school. Oral contraceptives are primarily progestational, with only enough estrogen added to provide endometrium to slough. The amount of estrogen has been decreasing sequentially since the 1960's since it's estrogen that adds the health risks: blood clots, breast cancer, endometrial cancer. You are correct that the associations can be murky, however. Migraine prevention is only one benefit of hormonal contraception. Reduction in lifetime risk of ovarian cancer and endometrial cancer, not to mention risks associated with unplanned pregnancy, are others. Woman on hormonal contraception tend to have higher hemoglobin levels too, perhaps adding to well-being. Nowadays more and more women are using progestin-only contraception-- Mirena IUD, Depoprovera-- because of the lower risks, and also to eliminate their menses altogether. These methods also have better compliance and lower contraceptive failure rates. Progesterone is perhaps the safest exogenous chemical we provide in medicine. "I am do not have any financial affiliations"
Hi Tony, thanks for commenting. I'm a bit more hesitant than you to fall head over heels in love with synthetic progesterones. I have heard too many women, even in progestin-only preparations, who have had terrible experiences. That said, I do agree the synthetic estradiol is more often the culprit. But it's important that the medical system starts recognizing women as variable, and prescribing hormonal contraception based on the documented baseline hormone levels and activity levels of their patients. The focus groups I have run on the topic suggest most doctors simply recommend their favorite brand as the first brand, then their second favorite, etc, rather than making recommendations on which brand or preparation to use based on any evidence about that patient's physiology. I'd be interested to read the papers that suggest women on hormonal contraception have higher hemoglobin, if you happen to know the citations. Thanks! NEJM has a review of combination pill benefits and risks, with prodigious references. 12. MilmanN,ClausenJ,BygKE.Iron status in 268 Danish women aged 18-30 years: influence of menstruation, contraceptive method, and iron supplementation. Ann Hematol 1998;77:13-9. 13. Rivera R, Almonte H, Arreola M, et al. The effects of three different regimens of oral contraceptives and three different intrau- terine devices on the levels of hemoglobin, serum iron and iron binding capacity in ane- mic women. Contraception 1983;27:311-27. Yes, these are old studies with some flaws; rightly or wrongly the idea has become lore in the practice of contraception. I agree that contraception should be individualized, and with so many varied options nowadays I think (hope) a more lengthy conversation is occurring. Various algorithms exist regarding how combination pills should be prescribed, with the progestin components accounting for the variation in side effects, ie, some are more androgenic, others more estrogenic, some with diuretic action, etc. I'd like to think that pharmaceutical reps are not overly influential, but that may be too much to ask. Yes, progestins are not without side effects (depression, weight gain, bone loss), but, as you've said, they are considered safer than estrogens. Of course, pregnancy and abstinence are also not without side effects either. is there evidence which is riskier, exposure to synthetic or natural hormones? Is someone on the pill being exposed to natural AND synthetic hormones, or does the body stop producing natural hormone when the synthetic ones are introduced? Where did the data for the preindustrial pattern of menstruation come from? Do we have info on preindustrial women who did not have children, ie. Do they have higher instances of cancer/shorter lifespans? and finally, could you give more links to articles concerning traditional/preindustrialized reproduction in general? 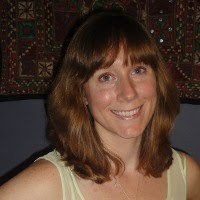 These are the archives for Dr. Kate Clancy's blog Context and Variation. You can find her at her new digs, at the Scientific American Blog Network, here. See who has tweeted my blog posts at Topsy.